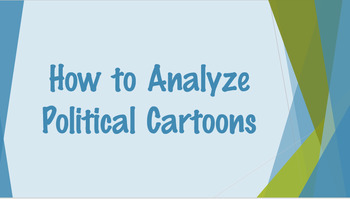 Here is a short and simple PowerPoint that teaches students what to look for when analyzing political cartoons. - PowerPoint includes sample cartoons: Two are very general that any students in most grades should understand. 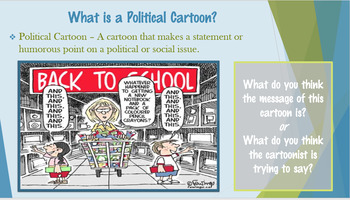 There are a few other cartoons that are more subject and current events centered, but they can easily be switched out depending on what grade and subject you teach. I generally use this presentation at the beginning of the school year or when I teach my imperialism unit. 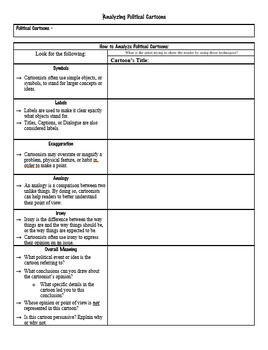 Accompanied with this PowerPoint is an Analysis worksheet that will work with any political cartoon. Hope you enjoy! Please remember to provide feedback and earn your TPT credits.